Apropos of Nothing: 20 inch Fixie Bikes, Burgeoning Trend or Evolutionary Dead End? 20 inch Fixie Bikes, Burgeoning Trend or Evolutionary Dead End? The new thing it seems is fixed gear, large frame bikes with 20inch BMX sized wheels. 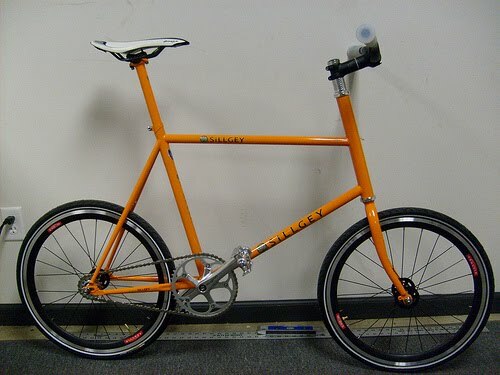 Actually, this configuration has existed for quite some time, but was pretty much restricted to folding commuter bikes. In many ways, this configuration makes some sense, smaller wheels are inherently lighter and stronger than large wheels and are also superior from a wind resistance and inertial perspective. The obvious problem with BMX bikes is their diminutive size, which makes them uncomfortable for long rides. (in the opinion of this 6'4" individual). The payoff for the small size is of course the ability to do stunts, I gather that this setup seeks to combine (some of) the tossability of a BMX with the greater leverage and comfort of a larger frame. Judging by the Japanese video below, it seems to work out pretty well, although with the probable downside of ride quality and steering twitchiness. Still have yet to see one in the flesh, but Boston has a pretty vibrant single speed community, so it's likely only a matter of time. Kindof the Yang to the 29er Ying or something.